We have plenty more quotes and data to illustrate the importance of our work, but not all are for public display. Most often they’re client confidential, sometimes they’re proprietary to our own company and other times they’re specific to a client’s niche business objective at the time. The quotes below should still provide a flavor of our success. Just that one influencer alone you introduced us to was the single most productive meeting I’ve had in at least a year. He can directly take us into almost twenty prospects we’ve not previously had access to. The upside opportunity there could be phenomenal for us. If it hadn’t have been for your Report we’d never have got our relationship with HP. That deal’s already brought us income. You’ve just saved us six months and many tens of thousands of dollars getting to market. We’ve reviewed the pilot you did for us. We like the results – and we’ve compared them with our other programs. We’re no longer taking the route we were. We want to roll out your program to our other markets now. I think we can save a lot of our budget by using Influencer50 before investing in a new salesforce in these markets we’re entering. When we do get the sales teams onboard, they’ll now be hitting the ground running. We lost a $3.5m deal because we didn’t know the guy you had at No.2. We certainly know him now. That consultant you made us aware of – he’s immediately just taken us into a $2-3m opportunity. Amazing. Thanks. Your work alone has done more to put us on the map than anything else we’ve done in the past five years. Without the insights you gave us, we’d never have the partnerships with the global firms we now depend on. The results you’re producing are standing me in good stead with my senior management team! What you’re producing is significantly helping our sales teams. Really impressed. I wish I’d have seen this Report before I came for interview here. The Identification Report you did for us is probably the best value marketing I’ve ever commissioned. Our department uses it every single day. I don’t know why every company doesn’t use you. What you do is terrific. I’ve looked at your work and compared it with what we had before. I want to dump that and go with you from here on. Your data looks much more robust. You have a fantastic business proposition here – very unique. Impressive. I look at your work and I wonder what we’ve been doing these past few years. Stumbling around is what we’ve been doing. What you’ve uncovered is so exciting for us. For the first time I now think we’re on the right track. What you have is the most refreshing new take on marketing I’ve seen in fifteen years. I’ve seen enough in our early work together to approve rolling this out to several more countries. We’d like to commission more work from you. Our directors have been very impressed. 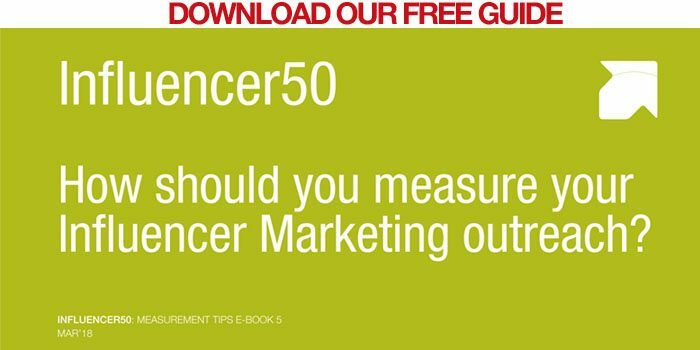 We chose Influencer50 because they have a very differentiated proposition and their early results for us look very promising.